It is not a tropical island where you lie on the beach, slathered with sun tan lotion, while trying to accumulate the evidence on your skin for your friends at home that you have been on vacation. It is not a third world place with old, rickety cars, pot-holed streets, and begging children. It is not a place where you need a dictionary or a translator to be understood or to communicate. It is a fascinating, colorful, vibrant, multicultural island which is a major commercial center. It is a modern place with perfectly good roads and plenty of shiny late model Mercedes automobiles. Most people speak good English, and communication is never an issue. It is a very safe place with a low crime rate. Besides being a commercial hub, it is also a laid back place where people always find time to talk to you. And yes, there are beaches here, but they are not that great, I have to say. The good news is that there is another island nearby, called Lankawi, which has excellent beaches. I did visit the main beach on Penang, Batu Ferringhi, but there were more water ski boats, banana boats, jet skis, and para gliding boats in the water than people. It did not surprise me since the water lacked the crystal clear, azure blue quality that you expect in a tropical heaven. But the beach was great for people watching. Once I came across some rather unusual beach attire which I had not seen on any beach before. Here is a Muslim woman, covered from head to toe, while taking pictures of her husband who went parasailing in his swim suit. 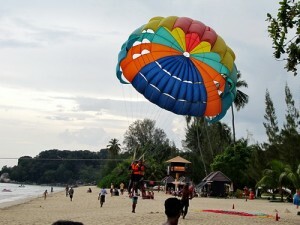 The beaches are not the main attraction on Penang. There is quite a lot to see here. 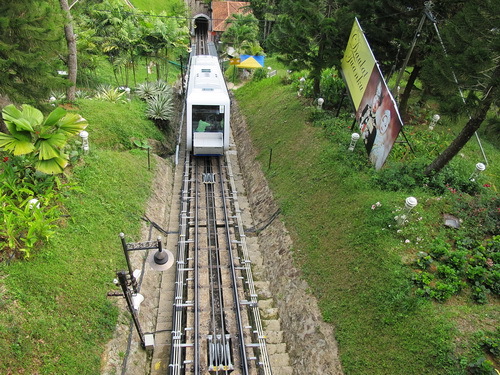 One day I went to Penang Hill, which is almost one kilometer above sea level, and it is incredibly steep. 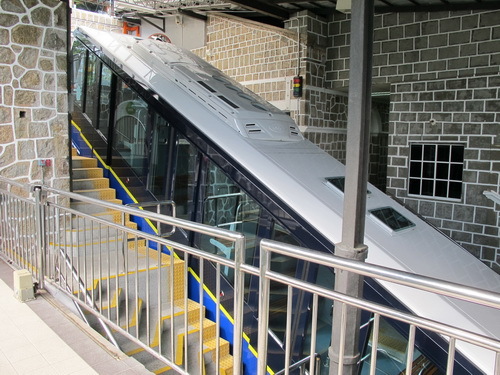 There is a Swiss-built funicular going up to the top. I have been on a number of funiculars in the world, but I have never seen one zip up the steep mountain at such an amazing speed. You are instantly transferred from a humid tropical climate to a temperate, cooler, refreshing climate. 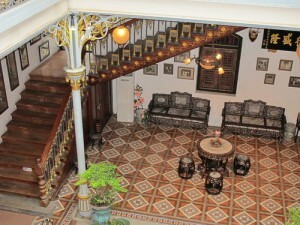 This is quite a luxury for a place not far from the equator. 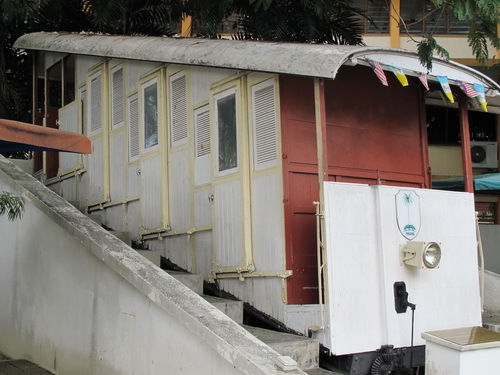 The funicular is the legacy of the British colonial officers who liked to build their houses on Penang Hill and needed a way to access their homes. Once you get to the top, you have a perfect view of the island. 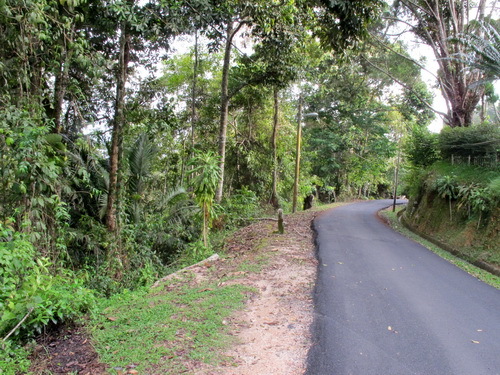 You can go on scenic walks in the midst of lush green vegetation, or you can take the easy route and rent a golf cart. Within a few minutes you can escape the sweltering heat of the tropics and relax in a climate which feels more like Europe than the tropics. However the British were not the only ones who lived in style on Penang. 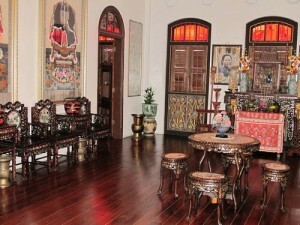 Look at the inside of this mansion built by a wealthy Malaysian trader in the early 20th century. Not too shabby in my opinion, and a far cry from a third world hovel. One day I went out from my hotel into “Little India”. This is the most colorful area of town with women clad in bright saris, gongs sounding in the temples, a smell of incense and spices in the air, and loud Indian music blasting from big speakers which every video shop (which is about every fifth shop, it seems) places right in front of their establishment. On that particular day the local Sikh community had assembled to celebrate the opening of a new clothing shop. The owner is the former priest of the Sikh temple in Penang, a wonderful person with a great smile coming from the heart. 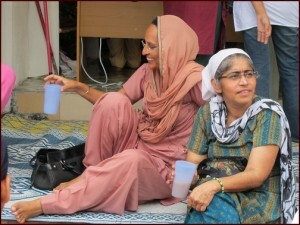 When I stopped by to take a picture, I was immediately invited to a plate of free food, sweets and Indian tea. Before I knew it, I spent two hours at their place, having many interesting conversations and learning more about the Sikh customs and culture than I had ever known. 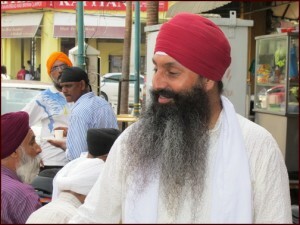 The Sikhs were some of the friendliest and most accommodating people I have ever met. They are also some of the most photogenic people with their turbans, long beards and flowing robes, and the women wearing colorful Punjabi dresses. The Sikhs are a warrior race. The men often have an imposing muscular physique, and they contributed one of the most effective fighting forces to the British army in India. You would never guess that most Sikhs are vegetarians. Little India is small enough to be navigated on foot. But if you don’t feel like walking, there are plenty of pedicabs willing to drive you around. This part of Penang can offer many surprises. One day I encountered an Indian band playing on the street, another day there was a group of teenagers putting on a dance performance in the middle of the street. At various times of the day there are ceremonies and music going on in one of the temples. You might even catch special events like the street party for the opening of the Sikh shop. The author, Shama Kern, is a long time resident of Thailand and explorer of southeast Asian countries. Hey Shama – nice doing some armchair traveling with you into these fabulous places. Nicely documented and great photos. I think your “Confirm you are NOT a spammer” is funny. As if a spammer would admit to it. LOL! Actually this button is only there so that the automated spam bots cannot post because they cannot see this button. You would not believe how many automated spam posts I would get otherwise. Real humans rarely post spam, that’s too time consuming. The spamming is all automated nowadays. Yes, it’s good, since I’m not up for those long overseas adventures right now, but have had my fair share mainly in southern India. So, I understand why you like the India part of the city where you are. I have tons of fond memories and other memories that are not so fond as you probably well know. Not always easy being in some countries, but an adventure at any rate. Right now I’m content to stay put for the time being. I am curious, you have “tour lady” in your email. Does that mean you are a tour guide or something like that? OH! its really an enjoyable tour. For how many days did you had the tour? I spent a month in Penang, and had a good time. You can certainly do it cheaper if you skip the tour arrangement. One thing I should mention: I don’t know how much Thai Massage you studied already. Pretty much all schools here in Chiang Mai teach a similar curriculum which is designed for a good basic education. Thank you for sharing your story in Chiang Mai. I have visited and lived in Penang, Taipei (Tainan/Kaohsiung), Singapore an Thailand. Each country provides colorful culture and fascinated people. I have been contemplating on retiring in Thailand and hope to make a trip there pretty soon. Would you and your wife open to meet for cup of tea? Sure, we’d be happy to meet you for a chat. Just let me know when you are here are we make arrangements.